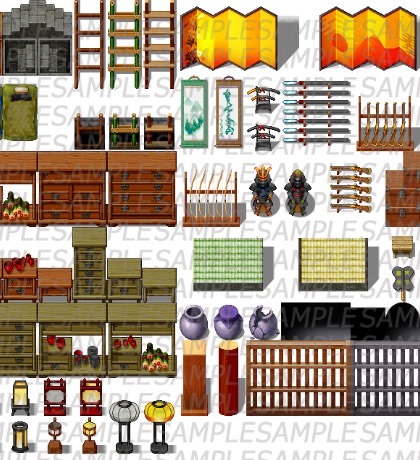 Samurai Japan: Castle Tiles| RPG Maker | Create Your Own Game! Japanese culture is known for its aesthetic beauty, attention to detail, and use of only the finest quality ingredients. Samurai Japan: Castle Tiles is a beautifully drawn new pack featuring many of the items you would find in or around a traditional Japanese castle. A real treat to behold, this pack is true to the traditional Japanese art of the highest achievement, filled withstunning architecture, furniture, items, and all you will need to create the perfect traditional castle atmosphere that will truly transport you back to that magical time and era. 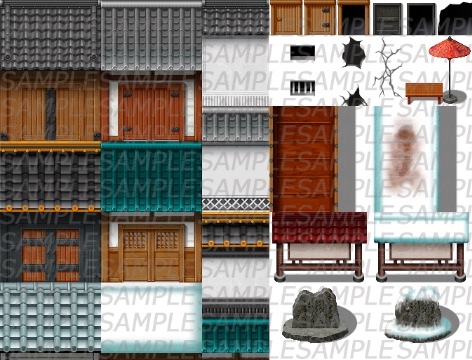 Featuring interior and exterior tilesets to create Japanese castles or traditional mansion with basic tiles as well as shoji screens, lanterns, with outdoor garden decor formatted for multiple seasons, teapots, stone masonry, toro, and much much more!